Working from a sitting position can makes it easier on your knees and back. This Deluxe XTV Tractor Scoot rolls effortlessly on 10 x 3 Never Flat tires for use virtually anywhere in the yard, garden and garage. Swivel seat adjusts from 15" to 19" for customizing comfort to specific tasks. Easy access storage bin for tools & supplies. Push/pull handle keeps long handle tools close while providing a backrest when sitting. Handle serves as an assist point when getting up or down. Included bucket clips let you attach 3 & 5 gallon buckets (not included) for more storage or harvesting. 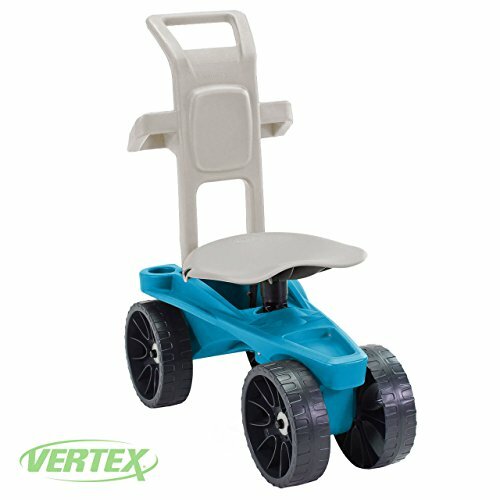 Supports persons up to 220 pounds. Ideal for garden, auto detailing, painting or projects where working low is required.